Observations have provided hints that the dark matter around one of the central four merging galaxies is not moving with the galaxy itself. Strong gravitational lensing as observed by the Hubble Space Telescope in Abell 1689 indicates the presence of dark matter-enlarge the image to see the lensing arcs. The Bullet Cluster: HST image with overlays. The total projected mass distribution reconstructed from strong and weak gravitational lensing is shown in blue, while the X-ray emitting hot has observed with Chandra is shown in red. Dark Energy is a key explanation for accelerating universe expansion. You can obviously find the experimental and observational evidences of dark energy through many internet search engines. The most important point comes from the observation of the supernova in galaxies which are accelerating away from us. Suggesting that the universe expansion is itself accelerating. We can start our investigation from Einstein who was trying to understand the nature of the universe and he was being told by the cosmologists at the time that the universe was fixed and unchanging. On the other hand, it can be understood that the distances between galaxies in the universe do not change. Now this statement became an immediate problem for Einstein because he knew that the only long scale force that was operating that he was aware of was the gravitational force. As a result, all the galaxies would exert a gravitational force which was an attractive force on all the other galaxies. And they should be as it was attracting themselves and pulling all the galaxies in. So the universe ought to be contracting. The astronomers at the time was however quite adamant that the cosmos was fixed. Therefore Einstein concluded there must be another force which is called “cosmological constant”, which was equal and opposite to the force of gravity. This balance is essentially maintained the galaxies in space in a fixed position. Now, before Einstein got very far with this analysis, a man named Edwin Hubble had come along and indicated that the universe was in fact expanding. We can easily understood by comparing this problem to the expansion of a rubber band. Let’s spin the rubber band at the 5 different points A, B, C, D and E respectively. Assume that A is fixed. With the scale factor, the distance between any two adjacent points is called a. Now, let’s stretch the rubber band, the coordinate points will move and a will obviously increase. It can be also noticed that as the point get further to A, the increasing amount of a increases. D(DE) be the distance between D and E. Δx is the difference in coordinate points (in this case, Δx(DE) would be equal to 4-1=3. a(t) is the function of time because a itself increases as the universe increases. Now let’s differentiate both sides of (1) with respect to time. Δx remains unchanged, but a does change with time so we will need to take the differential of a with respect to time. Now we can always multiply anything by one. Multiply (3) by a/a, which is simply equal to 1. We can simply put (t) away from a’. And that means if we know the velocity of a receding galaxy, you can calculate how far it is. It also implies that the further something is away from you, the faster it’s travelling. One important point to make the Hubble constant is that it’s constant everywhere in space today, but it does change with time. So it is a constant in space, not in time. So now we have a new picture of universe where all the galaxies are moving away from each other. There is no sense in which there is a center of the universe. That’d rather like dots on a balloon. You can take a balloon and mark dots on it. As the balloon expands, the dots moves away from each other. Let A be the center of reference frame that we happened to choose and B be another galaxy. From here, d is considered to be distance between A and B. In this case, A is a fixed position and B therefore will be moving away from A, with a velocity V which was previously demonstrated to be equal to H.D. Now the total energy of this galaxy will be equal to the sum of kinetic energy and potential energy. And the value of total energy must remain constant in time, which is named k.
On the right hand side of (13), 2k/m must remain constant because m, which is known as the mass of galaxy B, is also a constant in time. 2k/m can be considered to be equal to another constant k.
Moreover, the value of mass m will be equal to volume V times density p. As the universe expands, the volume will increase, but the mass does not because the number of galaxy remain constant. The density therefore will theoretically decrease and vary with time. And (21) is known as a simple version of Friedman Robertson Walker formula. It is an exact solution of Einstein field equation of general relativity. The formula describes a homogeneous, isotropic expanding universe or contracting universe that may be simply connected or multiply connected. Particularly, it can be noticed that 8.π.G.p(t)/3 is always positive. And if -k is always positive, the whole term on the right hand side is positive. And the left hand side therefore must be also positive. It means the universe will constantly expand forever and that’s called an open universe. If -k was negative, there might come a point where the negative value of k/a(t)² is larger the positive value of 8.π.G.p(t)/3 . And therefore [a'(t)²/a(t)²] will become negative. This situation would eventually stop the universe growing and start contracting. That would be called a closed universe. If k was 0, it would indicate that the kinetic energy and potential energy was balanced and this case is called a flat universe. On the other hand, the universe will continue to expand, but it will slow down and become an asymptotic value. It is only after an infinite amount of time. The time and space dimension represents x and y-axis, respectively. If we have an open universe, it will expand forever and never stop. If we have a closed universe, then the universe will expand, but it’s constantly being slowed by the gravitational forces, until the gravity eventually stops the universe expanding anymore and then causes it to collapse on itself. This process is named big crunch. The cosmos crunches back into a single singularity and can be understood as the reverse procedure of the Big Bang. In a flat universe, the universe expands based on the particular circumstances and being asymptotically towards a value, but never reaches it. It will, but only after an infinite amount of time. 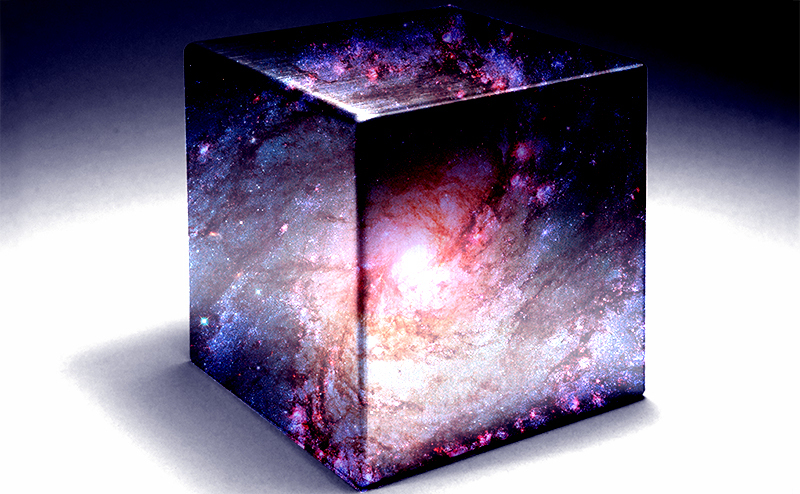 Let’s consider a cube of universe. In this case, p, M, V and a will be the density, mass, volume and sides of this cubed universe, respectively. If the universe is considered to be flat, it means k will be equal to 0. Now we will discover how a(t) varies with time. The initial way to do that is to guess. Let’s a(t) be described by a new exponential equation. Now we plot the value of a against the value of t.
At the beginning of time, in the first 10000 years, the universe would not have been matter dominated, but radiation dominated. When the Big Bang happened, the assumption is that a huge amount of matter was created. But all the matter that was created would have been equal to the amount of anti-matter created. Those matter and anti-matter particles would combine and annihilate and produce a huge amount of radiation in the form of photons. Surprisingly, the process also left a small surplus of matter, which is essentially everything we can see in the present universe. So now let’s consider our cubed universe which contains photons only. Assume that a is the length of side of the cube. The energy of photon is Planck constant times the frequency. Now as the universe expands, a also expands and λ therefore increases. Consequently the energy of the photon must decrease when λ increases. The high energy photon, possibly gamma rays created through the annihilation of matter and anti-matter had their wavelengths stretched as the universe has expanded. And the wavelength is now in the microwave regions and that’s what we see in the sky called the cosmic microwave background radiation. This type of radiation comes from all directions. In general, E is inversely proportional to λ and a. Where N is always a constant. Next, what is the energy density? The value is calculated by dividing energy value by the volume. Let’s p(R) and p(M) be the energy density for radiation and matter dominated universe, respectively. p(M) is the rewritten form of the equation (24). And once again, let’s investigate how a increases with time. With matter dominated universe, a expands based on the power of 2/3, which is derived in (36). I have pointed out that at the beginning of the radiation dominated universe. And that radiation would have an energy which is equal to Planck constant times the frequency. Now if you have high energy, you also have high temperature as a result of being directly proportional to each other. Where E is the energy, k is the Boltzmann constant and T is the temperature. At around 3000K, the atoms are ionized. The electrons in those atoms have so much energy that they all disappear from the atoms and the atoms are simply left essentially as the nucleus. In the very early universe, when the temperature is above 3000K, there would have been no atoms. They would just have been as it were hydrogen nuclei which were protons and free electrons. A huge amount of photons that had been produced through the anti-matter matter annihilation, would not be able to get very far in the universe because they would constantly be interacting with electrons and swapping energy. And consequently, the universe in those days would not be observable because the photons couldn’t travel through it. The temperature of the universe today is approximately 3K. At some points, when the universe cooled, it cooled enough for the electrons to be caught up by the protons to form hydrogen atoms. And when that happened, the photons would have a much easier direction to escape the current position. During this, the universe became transparent. On the other hand, it become observable. Rewrite the relationship between E, T, λ and a. In a matter dominated universe, a-today can be equal to c.t^(2/3), a-ion can be equal to c.(t-ion)^(2/3). t in this case is simply the age of the current universe. Using a graphing calculator provides that 1000^1.5 will be equal to 31622.7766. And t means the current age of the universe, which is approximately 10^10 years. Consequently, the acceleration has a scale factor of the universe that is proportional to t^(2/3). Now let’s consider the pressure and thermodynamics. Firstly, we have a cubed matter dominated universe containing all galaxies inside. And the problem is what pressure do those galaxies exert on surface of the cubed universe? The answer is 0 because those galaxies are bouncing backwards and forwards on the surface on the cubed universe. They are simply suspended in space as the cosmos expands. It will carry the galaxies with them, but there is no pressure on the sides. In general, in a matter dominated universe, the pressure on the sides of a cube is 0. In a radiation dominated universe, let’s suppose we think about one dimensional issue. A photon is travelling backwards and forwards between these two points A and B, at the speed of light. Where P is pressure, F is force and A is area. And the force F in this case is the rate of change of momentum over time. Let’s suppose that we have a photon with momentum p, travelling towards B and coming back. So the total change of momentum will be 2p. And the photon takes an amount of time to complete the experiment. Based on research, it can be noticed that the energy of a photon is equal to the momentum times the velocity. E / L is essentially the density term in one dimension. But we have to discover it in three dimensions so let’s now take our cube of photons which can travel in any direction. So we conclude that for the radiation dominated universe, the pressure is apparently equal to density. For w=1/3, P=p/3, then it’s the radiation dominated universe. As volume increases, the energy decreases. We can also conclude that the total energy is equal to the energy density times the volume. For w = 0, it’s the matter dominated universe, that gives us p=c/a³. And that’s exactly what we determined before. For w = 1/3, it’s the radiation dominated universe, that gives us p=c/(a^4). And that’s exactly what we determined before. By using thermodynamics, this problem has been successfully demonstrated. It means we discovered the same results. The equation (75) therefore is true. For w = 0, it’s the matter dominated universe. For w = 1/3, it’s the radiation dominated universe. So what happens if w = (-1)? So that means the scaling factor a exponentially increases with time. It’s accelerating with time and that’s how we think the universe is doing. And what is causing that acceleration?